Do you remember that weird ABC show “My Kind of Town?” Came out in 2005… the series premiere was shot in Greenville–as in Greenville, Alabama–and was hosted by this British guy you’ve never heard of… they stole a woman’s house and gave another woman a toilet full of cash and had townsfolk pose basically naked for a pretend calendar shoot and had the house band play “Sweet Home Alabama” a lot and said “Roll Tide” a couple of times… remember that? In early 2005, Crabbe, a 1997 Auburn grad (whom I profiled for the spring issue of Auburn Magazine), was seven years years into a burgeoning television production career that thus far had included stints at “The Late Late Show with Craig Kilborn” and “Last Call with Carson Daly.” He’d just spent four months filling in for someone at “Late Night with David Letterman” and was just knocking around as a freelancer, helping with an occasional pilot for MTV, stuff like that. Then ABC came calling. In late July, 200 Greenville residents flew to New York City to serve as the show’s entire studio audience. According to the Greenville Advocate, the town caught ABC’s eye in part because of its Best Small Town ranking on ePodunk.com. Subsequent episodes featured Mt. Horeb, Wisconsin, Hopedale, Massachusetts and Ellenville, New York. The exaggerated southern drawl host Johnny Vaughan worked into his hyperactive shtick for the Greenville episode bordered on the insulting, but the temporary transplants took it in stride. Ironically, everyone involved thought they had a ratings juggernaut in waiting. The show’s production crew spent two weeks in Butler County. 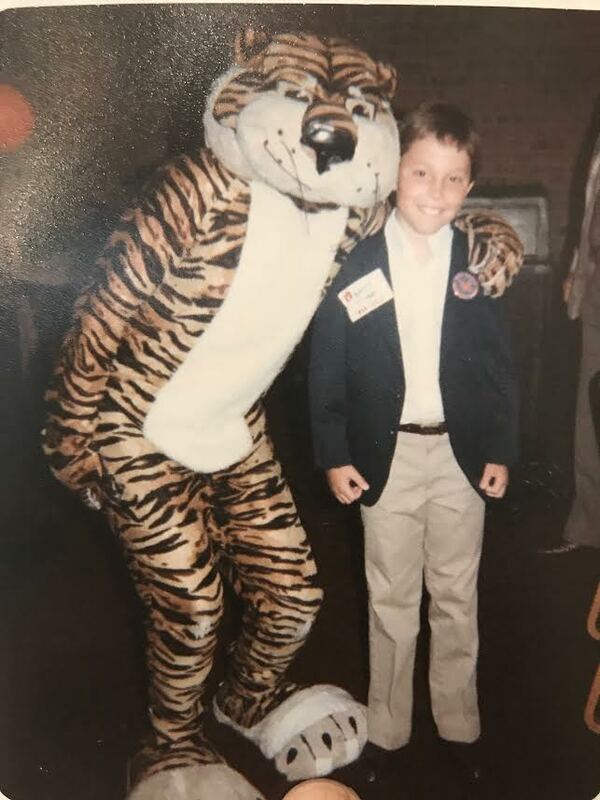 My Kind of Mascot: Young Rob with Old Aubie. “We’d send people to break into someone’s house to steal a beloved stuffed animal, then we’d put a PA (production assistant) on a plane to fly it over to Egypt to get a picture of it in front of a pyramid,” he recalls, almost incredulously. 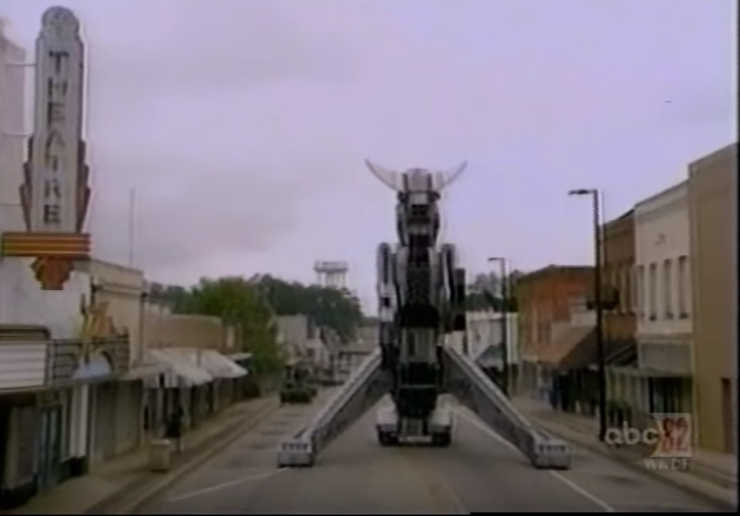 For the first segment of the first episode, Crabbe and Co. steered fire-breathing monster truck show staple Robosaurus into downtown Greenville to mangle and incinerate a man’s tractor (while he watched via satellite) before ultimately having a Greenville city councilman ride onto the show’s set with a brand new replacement. His next gig with a British guy host turned out a bit better. In 2015, Crabbe left a supervising producer gig at “The Tonight Show” to help launch “The Late Late Show with James Corden.” He’s won three Emmys in just three years as the show’s executive producer. It’s like a dream come true, he says.